It is possible to win all 3 hands but only walk away with 6 points because each of your boxes have weak combinations. E.g: 2 pairs, 1 pair and Ace high. You need stronger hands if you want to get more points (which you do). As you are learning the game, focus on learning how many extra points you can get for each hand in each box. For instance, a full house in the bottom hand will give you 6 additional points. A flush in the middle hand will give you 8 extra points. 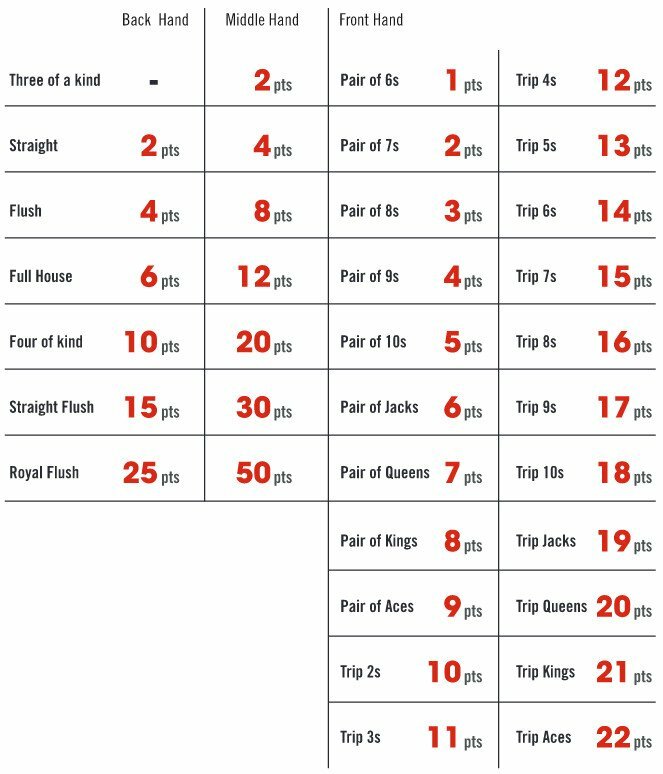 A pair of aces in the top hand will land you 9 more points. Many newcomers to OFC dismiss the top hand because it’s only 3 cards ! But that is the wrong approach if you’re trying to build up your points effectively. 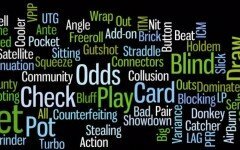 Placing your initial 5 cards is known as “setting,” and it may be the most critical part of OFC poker. The smarter you become about setting those first 5 cards, the quicker you can put together big hands and earn more points. The goal is to set your cards in such a way that they can become massive hands if you get a good card next. For instance, pairs can often turn into trips or a full house. This holds true for straight and flush draws as well. You should always try to get a pair (ideally, QQ or better) in the top hand and a higher pair, or even two pairs, in the middle hand. 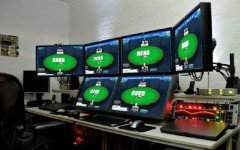 Like in Texas Holdem, in OFCP you should always think your hands through two steps ahead. Here of course the variance is higher and there are no bluffs at all. However, you still can plan your possible actions depending on the cards that may come next. 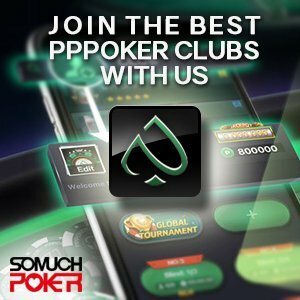 Balancing the pursuit of making your dream hands and managing the cards you actually get is the key to success in this game. You need to keep track of the up-cards (each players cards that are visible) in order to work out what your outs might be. This helps you calculate the best odds to improve each of your hands. All of the up-cards are clearly out of play, so you can strike them off your list of possibilities. By working backward from the up-cards, you can figure out how many cards that remain in the deck can help you build good top, middle, and bottom hands. 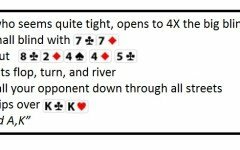 For instance, if it looks like the flush draw you were shooting for isn’t going to work out, you might be able to turn it into a straight or two pairs. While you might get excited at first about just winning 6 points per round, you’ll quickly discover that’s not nearly good enough to win on a regular basis. In fact, most big wins come from hitting Fantasyland (the bonus hand that allows you to see all of your cards at the start of a round). Your best hands, such as straight-flushes or four-of-a-kind, which bring you the most points, will almost always come from Fantasyland. If you do that, you’ve taken care of your top hand up front. 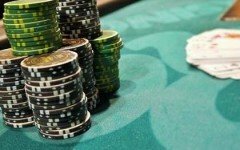 All you need for the middle hand is another Ace, and for the bottom hand you just need to put something together that is better than your top two hands, which typically isn’t that difficult to do. In some ways this point contradicts point #5. But, once you get good at reading the game, the contradiction is easy to avoid. You learn to read when you can go for Fantasyland and when going for it is pure fantasy based on the cards you’ve been dealt. Always start by evaluating your risks. A pair of Aces in the top hand can be difficult to beat with your other two hands, so don’t put it there just because you’ve got it. Compare that pair to the rest of the cards that you’ve got as well as the other cards that you see in play. your lowest cards in your top hand. Consider altering this rule if it looks like you can make a flush or straight with the first five cards your dealt. 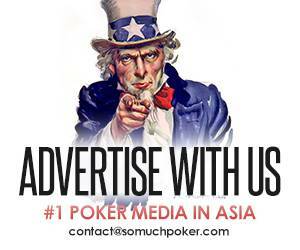 A good straight or flush in your bottom hand gets you the kind of royalty that earns you OFCP points. You can get great royalties with strong middle hands. But that’s because it’s so difficult to do anything better than trips or two pairs when you still have to beat that hand with your bottom hand. 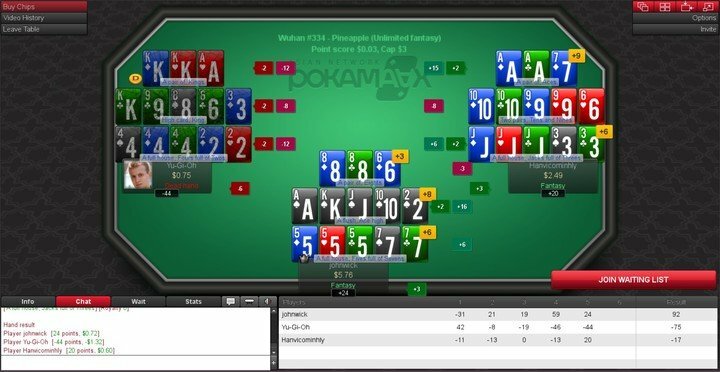 If you don’t save your flushes and straights for your bottom hand, you’re setting yourself up for a lot of dead hands. It’s a solid strategy to play it safe when you can tell that your opponent is going to foul. But when you find yourself falling behind, playing it safe won’t be enough. When it looks like you’re going to lose all three boxes, go for the gamble ! It’s all you’ve got ! For instance, if you’re risking a scoop in the later streets and you’re facing an opponent with good hands, it’s worth considering putting your trips in the top hand with a gunshot in the middle. It sounds really risky, but when you’re stuck in this moment, it might turn out to be worth the trouble. If a player can’t place their hands in the right order (for instance, if their top hand beats their middle hand in the end), that is a foul, and the player is considered “dead” for this round. 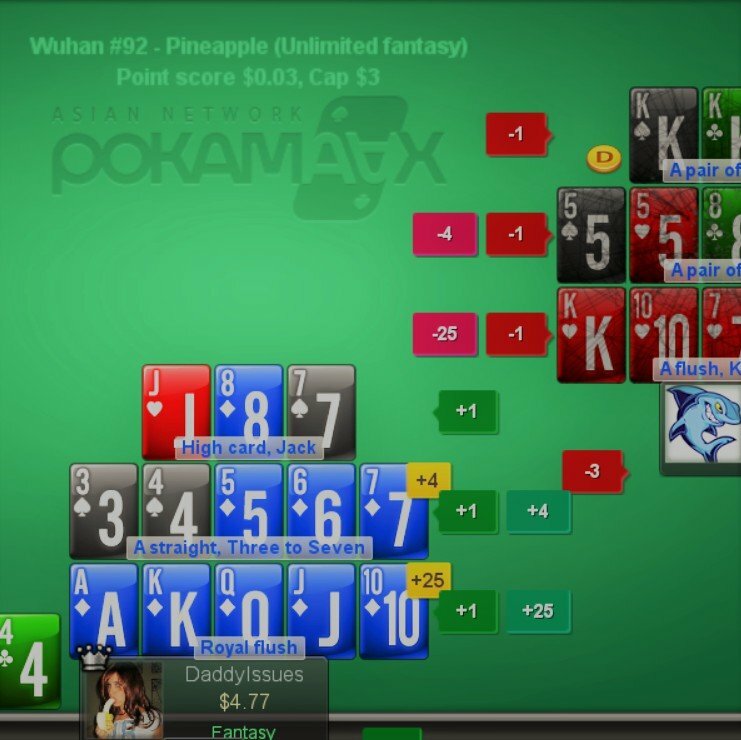 When it looks like your opponent is going to foul, back off from risky moves (such as Fantasyland). Focus on making a solid 3 hands so you can take the full 6 points. 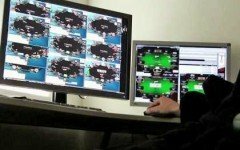 Because of the size of the swings possible in OFC poker, keep your stakes small at first. OFC is a game of action. You can’t play it well if you’re worried about diving too far into the red from the very beginning.